This year our British Columbia Moose Hunt went as planned. We shot and lost a bull moose, had two flat tires, my dog had an anaphylatic reaction to a puncture wound he received, one quarter of our moose meat got bone sour and I lost my two way radio. Hey... wait a minute. That is NOT how our hunt was planned at all. Actually we did have a good British Columbia Moose Hunt in the end. No-one was hurt, we harvested a nice bull moose and my dog survived. Fortunately for us we were prepared for these minor emergencies: two spare tires, Benedryl as well as an extra radio. It pays handsome dividends to venture out into the wilderness well prepared. I suggest you make a list of supplies to take with you when out hunting moose. It does not matter if you hunt moose in the lower 48, Canada or further north to the Yukon or Alaska. You had better be prepared for all that mother nature can throw at you. Because we were prepared, we were able to complete our hunt, successfully. Please follow the link if you would like to read the entire story about our British Columbia Moose Hunt. Thanks for reading and don't forget to share YOUR moose hunting experiences... good or bad. We can all learn from each others mistakes. Join in and write your own page! It's easy to do. How? 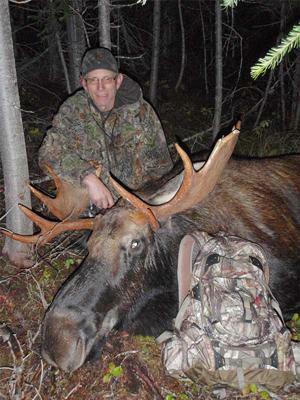 Simply click here to return to Bow Hunting Moose Stories.